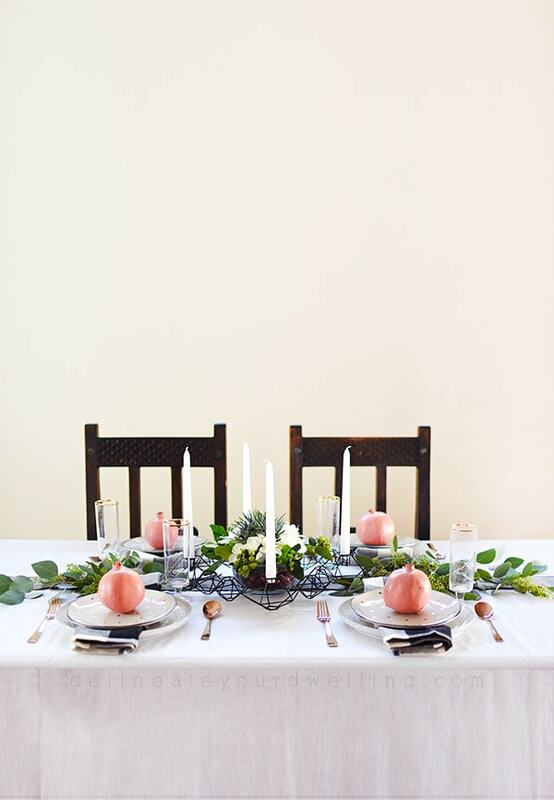 INSIDE : Set your table with this minimal decor for a simple and inexpensive Fall, Autumn or Thanksgiving Table in black, white, green + pink. Everyone has their “thing”. Some plan the meal for weeks in advance. Some worry about the entertainment throughout the day. Others are concerned about starting the food as early as possible so the rest of the can be spent relaxing. 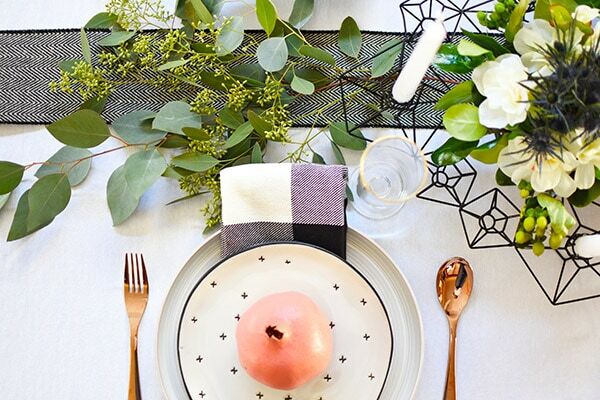 As much as I love enjoying all of the above, I really find joy in creating and enjoying a pretty table setting on Thanksgiving! 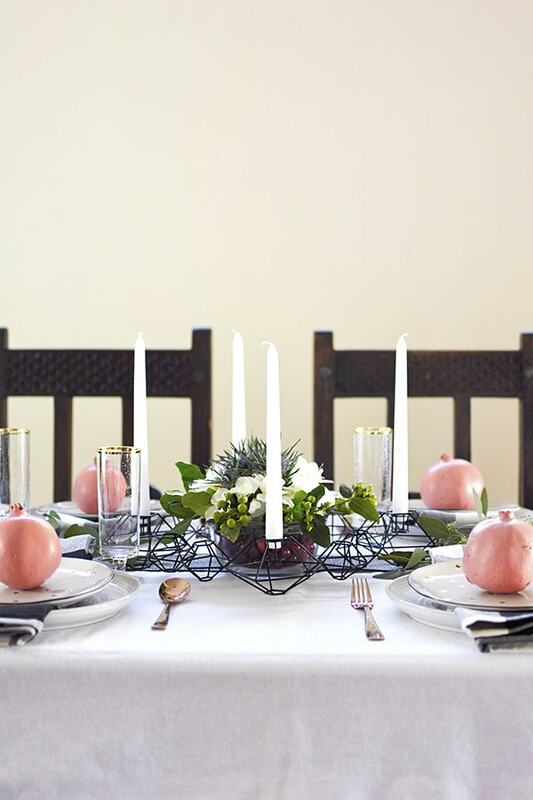 So today, I am sharing my Thanksgiving Table in black, white, green + coral. 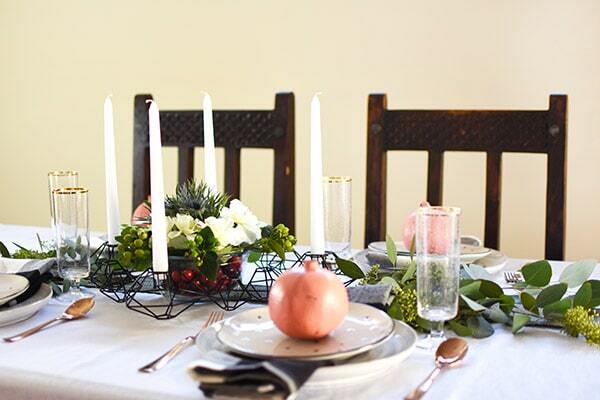 Each year I love dreaming up my new table setting for one of the biggest meal related holidays around, Thanksgiving. Over the years I have done quite a few different styles and colors. I’ve done a table of blue, a table of green + gold, and a very colorful but minimal table last year. 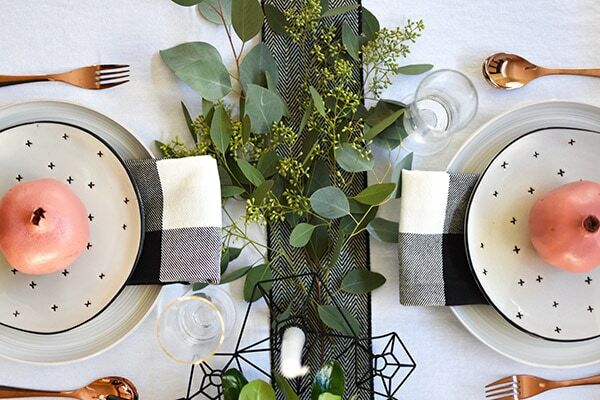 As you may have heard me sharing on Instagram stories, this year I wanted to incorporate black and white into my table more than ever before. However, it wouldn’t be me without a little color thrown in there, too. 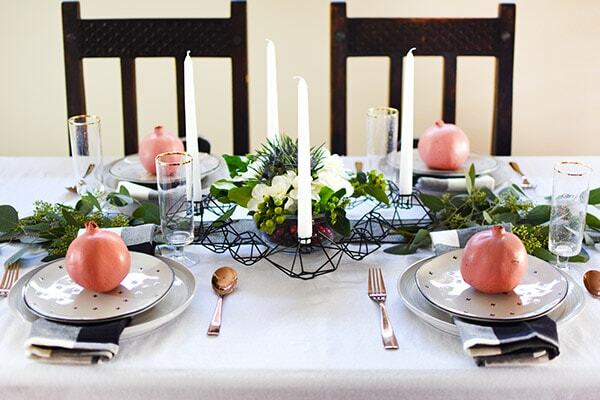 The first thing to figure out when setting your thanksgiving table or any table for that matter, is the center piece. 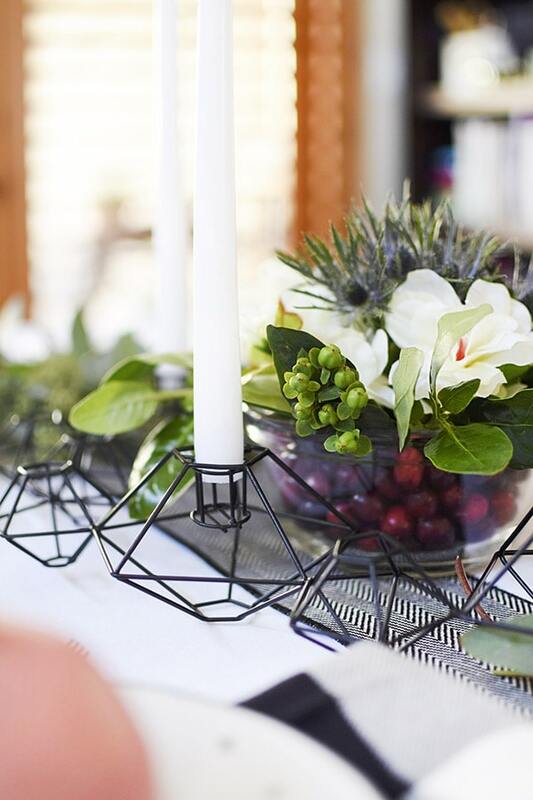 I found this gorgeous black wire candle holder/geometric wreath at a local shop and fell straight in love! 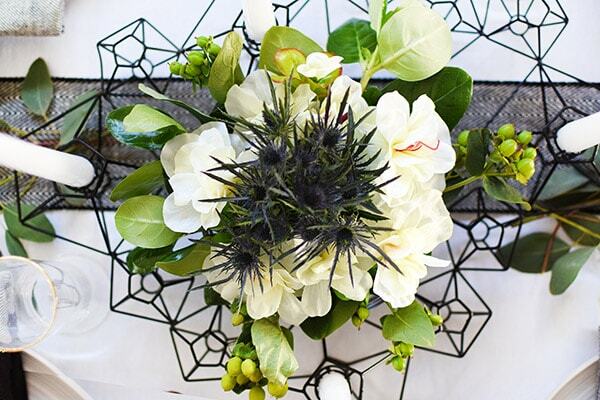 I was able to tuck in a floral arrangement of greenery, white flowers and then purple Thistle flowers. All of the flowers were sitting a bowl of water and cranberries! Next up is the dishware, silverware and napkins! I knew using black and white as my base colors, I wanted buffalo check napkins and I really loved the quality of the ones I got. I plan to use them for many occasions in the future. Then I set my everyday white dishes from West Elm on the table. I recently bought a set of these dessert plates from Target’s Harth + Home line and was thrilled with their price and quality! And I bought a set of Rose Gold utensils a few years ago that I always get out for more formal occasions. The final touch to my place setting was Gold Rimmed Bubble Glasses. After so much black and white, I decided to add a pop of color and pomegranates were my go to choice… but I didn’t care for their red color. SO I PAINTED THEM CORAL! That’s right, I got out my coral spray paint and gave each of them a nice even coat of paint. 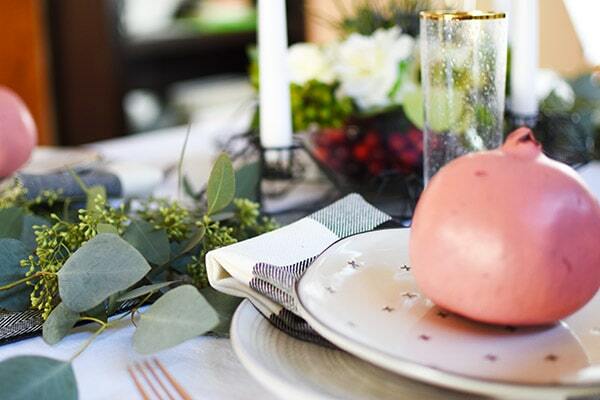 I was thrilled with their outcome as they add just the most lovely color to the table! I am a firm believer in making your table work for you with the things you have and using the colors that speak to your heart and home. 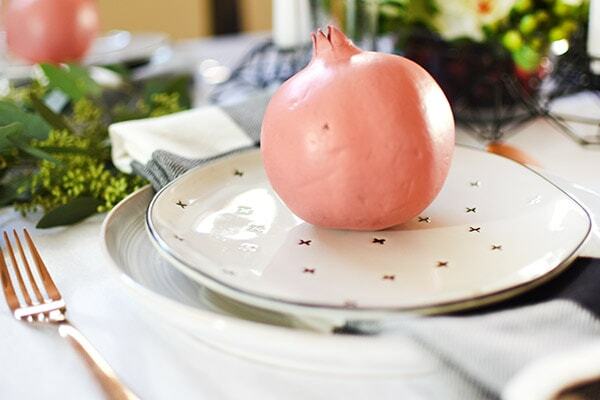 And sometimes it means getting out your fancy chinaware and sometimes it means spray painting pomegranates – ha. I struggled with using such non traditional colors but in the end I was really quite pleased with how everything turned out. 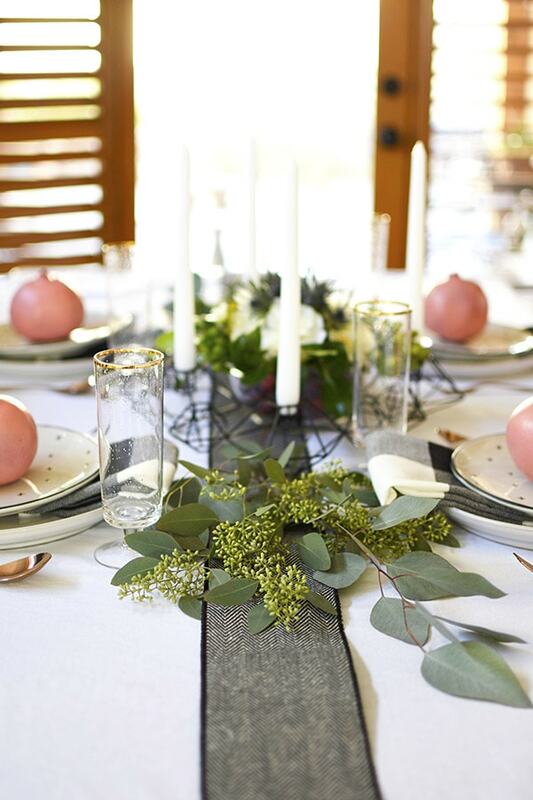 And as much as I adore setting a lovely table each year, more than worrying about the colors and silverware and the pretty plates… I love spending time at the table with the ones I hold most dear. 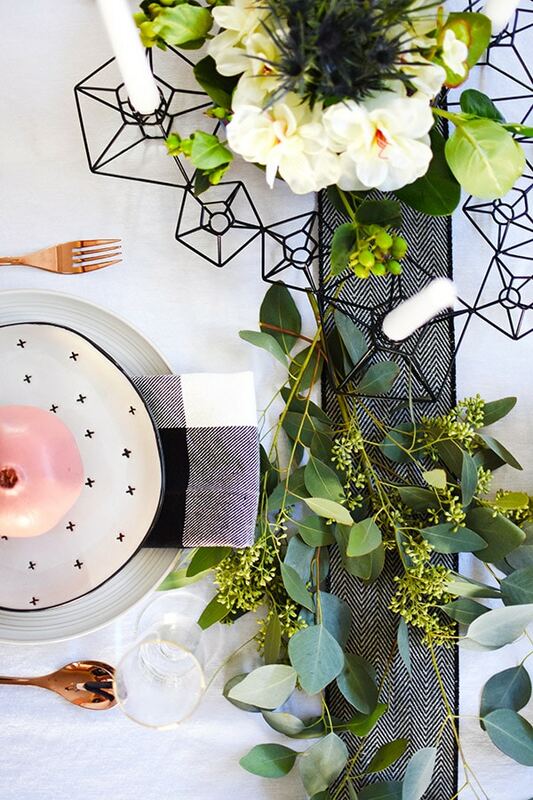 Looking for some of the lovely items I used on my table? By the way, tks for 2018 calendar! Lovely post, the colors ore refreshing. Where did you find the wire wreath? Looks like it would make a great advent wreath. Thanks Jill! It’s from Spurline Supply co. There are only 4 candle holders on it, but it sure is lovely! Thanks! I really need to go there. Second time this week someone has mentioned it. 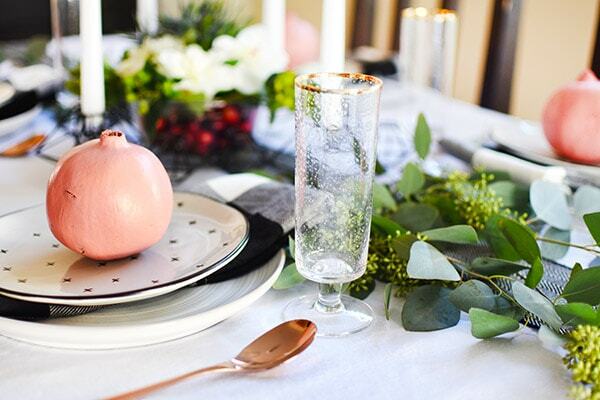 I LOVE those coral pomegranates…what a brilliant idea. And it looks so lovely with the black and white. 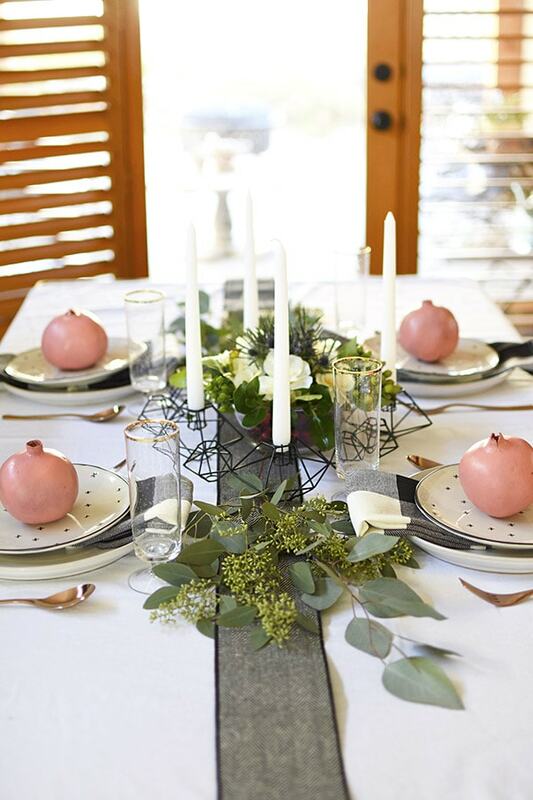 Your table is just perfect for Thanksgiving. You are too sweet, Lynn! 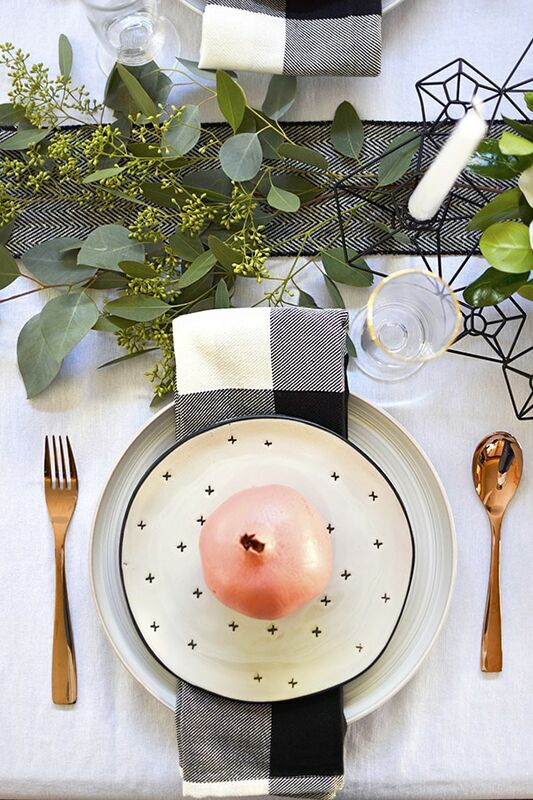 The pomegranates definitely make the table pop. Hee hee. Thanks for stopping by today.